Bring fine essential oils to your feet - straight from the garden. Each time friction takes place, our step-to-release technology transfers to your feet microscopic bursts of the finest dry scents. So your feet get an awesome kick of fragrance - not the room! Dermatologist tested. Hypoallergenic. 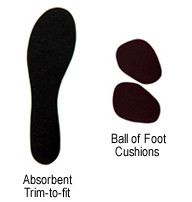 2 pair pkg - $11Ball of Foot Cushions offer thin foam cushioning to ease foot pain in high heel shoes. The top layer has a soft suede-like feel. 2 pair pkg - $15Take the squish and smack out of sandals with these trim-to-fit peel and stick liners that use our classic, special blend non-woven wool fabric. Super thin at 1/8 inch. If you are allergic to mint or jasmine flowers, you should not purchase Fragrant Footings. The essential oil fragrances truly are straight from nature! Dermatologist tested. Hypoallergenic. Non-sensitizing.